Huawei unveiled a stunning smartwatch just hours after LG did the same. The Huawei Watch is actually more compact but has a bigger, sharper screen than its Urbane rival, more customization options out of the box too. The Huawei Watch is made out of cold-forged stainless steel. The case measures 42mm in diameter - compact for a smartwatch and about average for a regular watch - and is 11.3mm thick. It's quite light as well, which may not be your thing if you prefer heavy watches. The body comes in Silver, Black and Gold. The wristbands connect to the watch's body with no gaps (the LG Watch Urbane had some air between them), which looks great. The standard wristbands include genuine leather options along with metal mesh bands and even one fabric wristband. The bands are interchangeable and Huawei had a wide selection on display, some of which were quite premium. The clasp could have been better though. The company claims the watch can be worn on either hand, however the off-center crown doesn't seem to comfy if you wear it on your right hand. The screen is a 1.4" AMOLED, perfectly round, with 400 x 400px resolution. It tops the LG watch in terms of sharpness, though seeing one after the other we didn't notice a groundbreaking difference. We were under high-power stage lights when handling the Watch and the screen remained perfectly legible the entire time. More importantly, the Huawei Watch is the first smartwatch with a scratch-resistant sapphire glass. Some Apple Watch models will have it too, but it's strictly reserved for the high-end offerings. Huawei has made 40 watch faces and they look amazing, at a glance they feel like an actual analog watch. The flat geometric design of Android Wear that crops up when you use the advanced functions the illusion breaks. The Huawei Watch has a built-in heartrate monitor and will work with a custom Huawei app to track your health and fitness. The company has partnered with Jawbone and the app will support additional wearables, but you can just use Google Fit if you prefer. There's also 6-axis motion tracking, a barometer and a vibration motor. The watch is compatible with Android 4.3+ phones and uses Bluetooth 4.1, giving it a range of about 10m. It has a 300mAh battery, which Huawei claims is enough for 1.5-2 days of casual use. 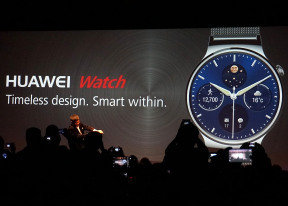 The Huawei Watch will launch globally sometime around the middle of the year, the price is yet to be confirmed.